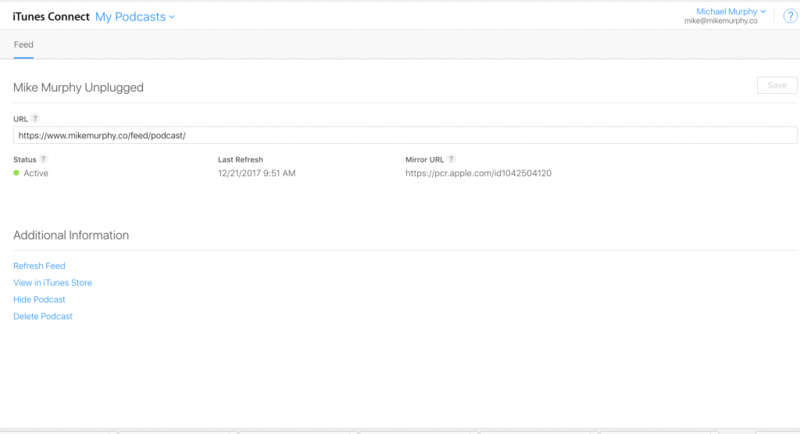 Today is all about Apple Podcasts Connect & the brand new Podcasts Analytics that everybody has been waiting for. What is Podcasts Connect by Apple? Part 1: looks at the features of Podcasts Connect to manage your podcast, launch a new podcast and resources to learn all about podcasting. Podcasts Connect is a website/portal that was launched in 2016 where you can manage existing podcasts, launch new podcasts and view analytics and performance of your existing podcasts. It is also the home to Podcasts Analytics to view statistics and data on your podcasts and episodes. Apple is not consistent with the name. You may see iTunes Connect or Podcasts Connect or Apple iTunes Connect, but they are all the same thing. When you first visit PodcastsConnect.com, do not mess with your RSS feed or the Mirror URL unless you absolutely know what you are doing. Always use caution with your RSS feed as that is how your listeners subscribe and get updated every time you release a new episode. Manage, Validate & Submit Shows and Learn all about Podcasting. Tip:To make a Bookmark in Chrome: Cmd+D to create a shortcut. Every podcast you have created both new and old will be in Podcasts Connect for you to Manage.If you do not have a podcast you should see RSS Feed with an empty text box. This will be for validating and submitting a new podcast which I will get into in just a bit. If you have a podcast you should see the cover art when you log in, so go ahead and Click on your Cover art to manage it. When your podcast is active and healthy you will see a green dot. If red, there is a problem to fix. Whenever you are having issues with your podcast or maybe you published an episode and it is not showing up in iTunes, sign in to Podcasts Connect and check the status. It is not usually necessary but if you made changes to your podcast metadata and it’s slow to update in iTunes, you can manually refresh your feed. You can also see when the last time Apple refreshed the feed which can be helpful to know when making modifications. Mirror URL: This is a permanent link to your RSS feed. If your listeners subscribe to your podcast via the mirror URL they are redirected to your RSS feed in the podcast app and iTunes so you can change the url without losing subscribers. Only use this is you know what you are doing with RSS feeds. View in iTunes, so you can check out your podcast how it looks in the iTunes Store (always a good morale booster when feeling blue). Hide Podcast. 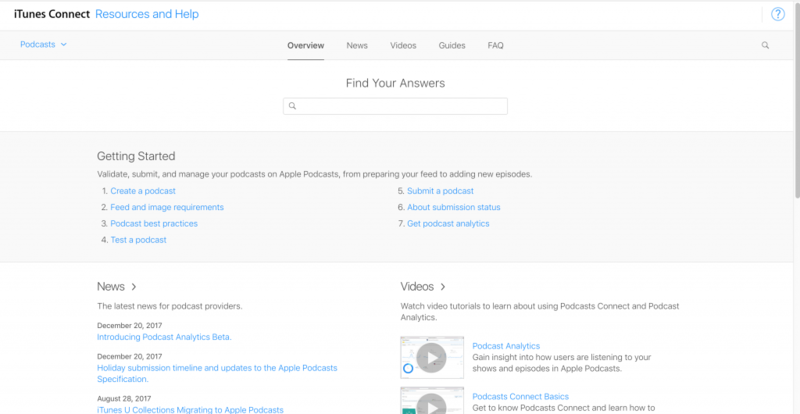 Allows you to keep your podcast active but undiscoverable or unlisted in iTunes. This Library of Resources has FAQs,News, Videos, Guides all about podcasting. You can access the Resources in Podcasts Connect in the dropdown menu in the upper left under My Podcasts. The third feature of Podcasts Connect is Validating & Submitting your podcast. These can be done at the same time and is the last step before you go live to the world with your podcast. You will follow the same process if you are brand new to podcasting or if you are adding another show to your existing podcasts. Look for the little Blue Plus Symbol in the upper left corner to add a new RSS Feed. When you are ready to launch your podcast, first, you copy the RSS to your clipboard (cmd+c), then login to Podcasts Connect, Click the Blue + or paste in the empty text box and hit Validate. If there are no errors you will get the green light. Fix any errors if you get them and the next step is to press submit right next to the Validate button and you are almost a podcaster. You will get an email right away that tells you iTunes received your podcast and will review it for quality and content and the next email you get in 24–48 hours usually will let you know you were approved and now listed in iTunes. Congratulations! Available to podcasters in December of 2017 and found in the dropdown menu of PodcastsConnect.com. It is located in the dropdown menu in the upper left when you sign into Podcasts Connect. 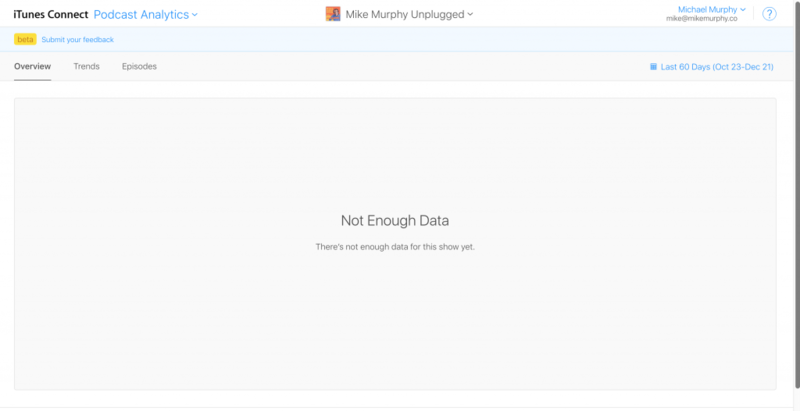 According to Apple, the data you see for your shows started on: 9/19/17, so episodes or shows before that date there will be no analytics. Apple started collecting data 9/19/17 so you will not get analytics for shows before that date. If your listeners are not on iOS 11 or Android, etc, their data is not included. Unique Devices. Any iOS device using iOS 11 that played your podcast will be counted. If you listen on an iPhone and then switch to your iPad to finish listen to a podcast, that will count as two unique devices. Time Listened: The sum of how long users listened to your podcast. Trends Area can be helpful if you have a bit of data to analyze. You can visually see listener patterns over time. For example, you can now see Total Time Listened and look at a graph that tells you at what exact part of the podcast people drop off or quit listening. Very powerful information for creators of podcasts and videos. Listener behavior and marketing go hand in hand. As a creative, if I see notice a trend in how people listen to my podcast or watch my videos, I can make changes to make better content. If you notice a lot of devices dropping off at the very beginning of your podcast, it might be because you don’t tell them what the podcast is about or maybe they do not like the sound of the intro music. The new Apple Analytics may be limited at the moment, but it’s a great step in the right direction and it is my guess there is more on the horizon in store for 2018. And study the numbers to make sure you are creating podcasts people want to hear.